Our first night at the SWRS, we all took our killing jars to the sheets to catch some moths. In the woods surrounding the station (and even right on the porch!) they had sheets hung up with black lights and mercury vapor lights set to attract insects. We were giddy with excitement, trying to identify moths, all trying to grab the prettiest or most unusual ones. Late into the night, we sat in the lab pinning our fresh catch, occasionally venturing out with headlamps to gather more. 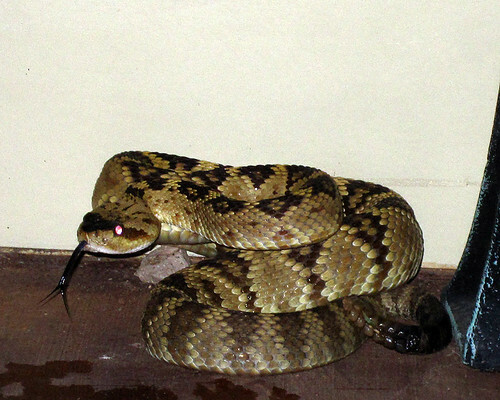 This is who had slithered right up to the building. This is the black-tail rattlesnake, Crotalus molossus. What a beauty! I had never seen this species before. Two years ago I did find a shed skin of a black-tail (I was able to identify it by the scale pattern on the head) but that’s it. So it was pretty neat to add another reptile to my life-list. Once everyone had taken photos, we realized we needed to find a way to move a venomous animal away from the laboratory. No one had a snake hook on hand, so we used the next best thing. A butterfly net. Hey, it worked! 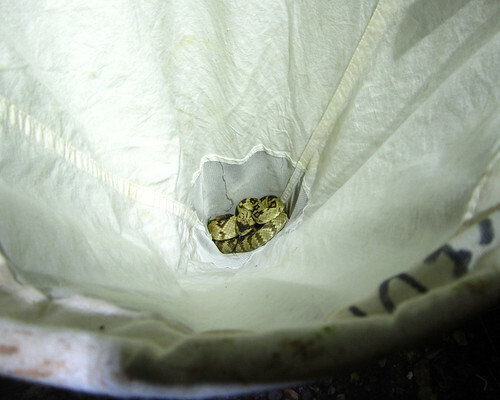 The cute little snake was moved safely away, and we all went back to work. Unfortunately, I only saw one more snake during the trip. Didn’t have much time for road-driving for herps… that will be on the agenda next time for sure. Posted on September 3, 2011, in Arizona Lep Course, Vertebrates. Bookmark the permalink. Leave a comment.